I met up with my brother and his fiance and we have a chance to play two 400points 3-player Confrontation battles. For me it was the first time in years and since we only decided to play last minute, I didn’t get a chance to finish my Orcs of the Behemoth so i had to settle for my paint-to-play Cynwäll Elves who are stand-ins until my Orcs are completed. 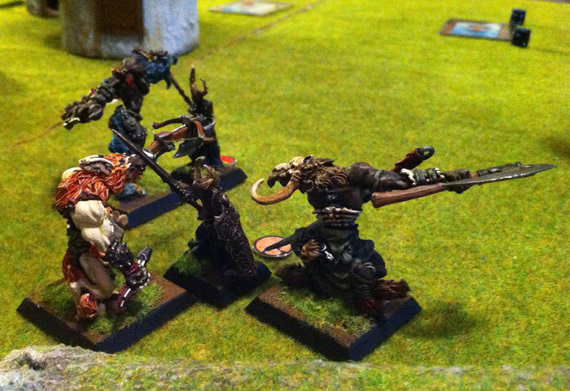 My Elves faced my brother’s Undeads and his fiance’s Wolfen. 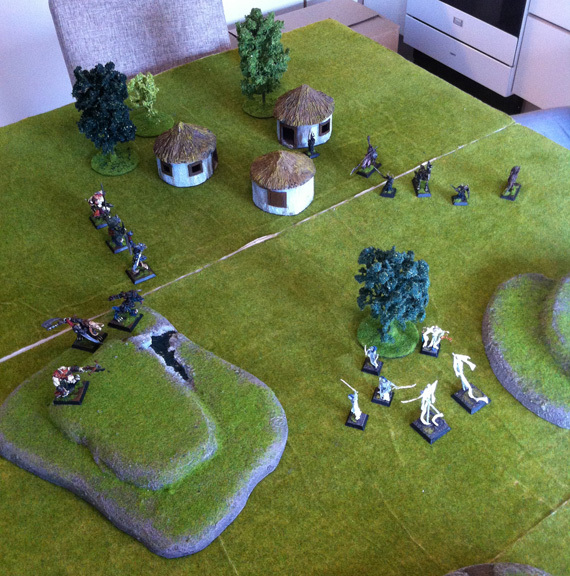 Here are photos of the first battle but I can reveal I lost both games horribly. The first game was with no Magic or Miracles mainly because none of us could remember the rules. However, in the second game I had read up on Miracles and brought some for Soïm the Zealot making him somewhat more useful in the second game. 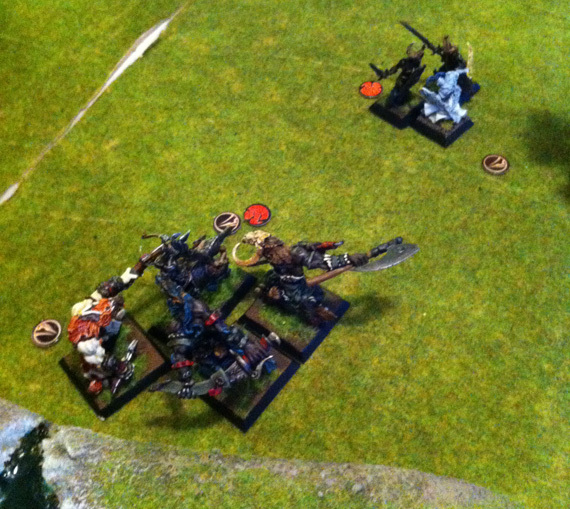 I think the only real tactical placement during set-up was the Wolfen with crossbow. 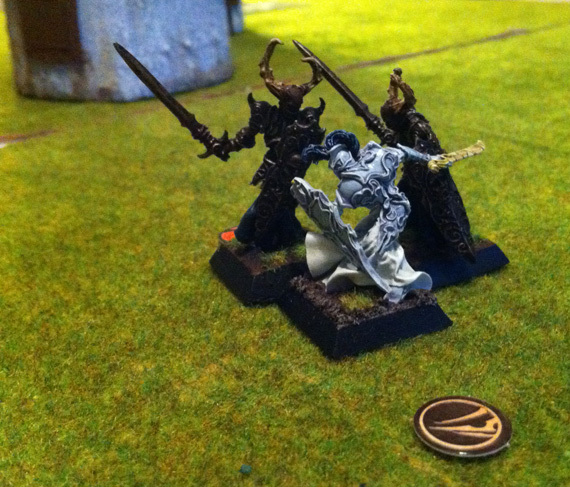 As it was the only miniature on the table with a ranged weapon it was a valuable asset. Not content by being outrun by Wolfen and Elves the Undead brought cavalry. The Elven “line” doesn’t look quite as organised. 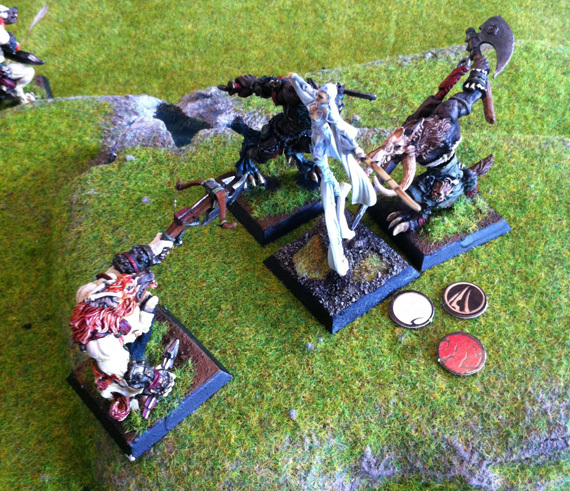 I very quickly made the mistake of splitting my army into three directions: One Echahïm flew twowards the Wolfen, the other towards on end of the Undead with Soïm charging the other on his own while the Asadars was stuck in the middle. 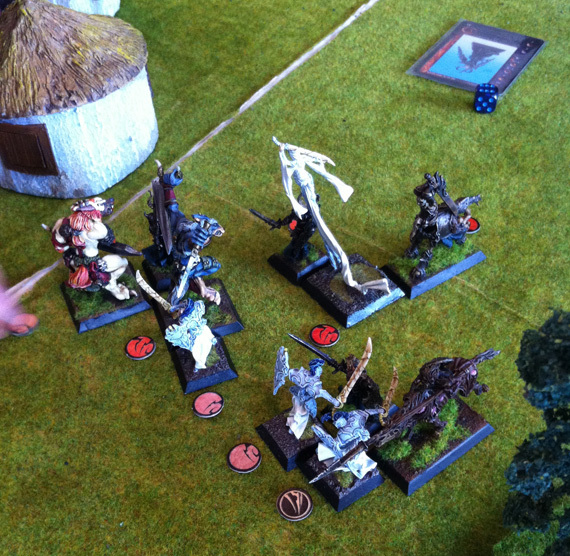 All resulting in Soïm getting killed in first round of combat! He did better in the second game but was frozen by poor fear rolls at the start. Adding miracles made him worth his points though. Undead and Wolfen kept their heads calm and armies together. Disaster start, but all said and done the Echahïm held the Wolfen on the hill including the one with the crossbow for a few turns and I learned that counter-attack is a valuable skill. However, the Wolfen not held by the Echahïm decided to attack the Undeads and with their powerful legs it didn’t take them long to reach the other battle. 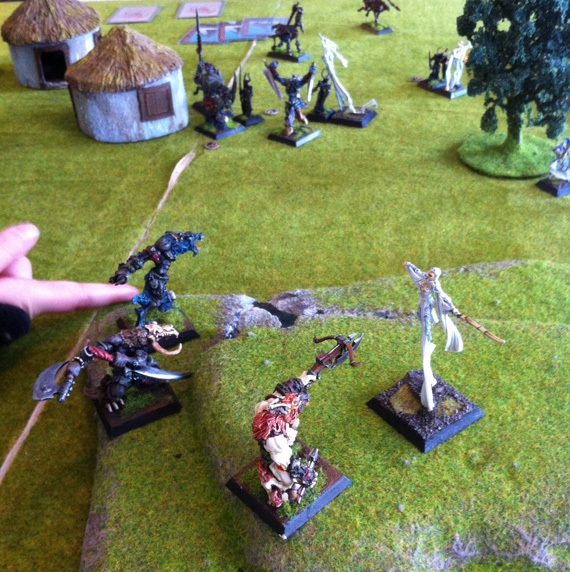 With Wolfen hitting hard everywhere (and Undeads no less so) the Elves where disappearing fast from the table. I was struggling in both battles to understand the value of the Elves against superior dice numbers caused by Born Killer and steads. I didn’t use Sequence which may have changed my outlook but I doubt it. My conclusion so far is higher numbers of dice wins no matter attack skills. 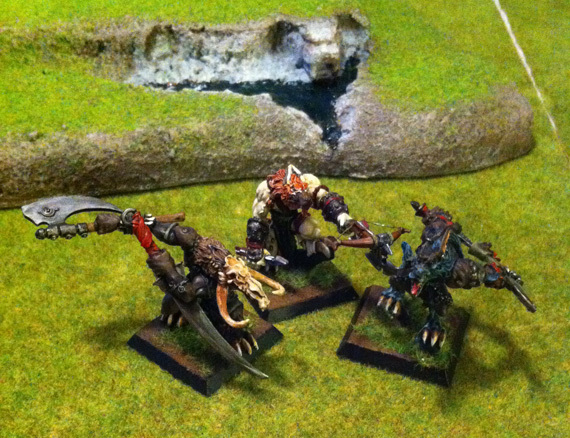 Having torn the Undead boss apart, the Wolfen were ready for some more undead meat as the Dark Paladins had finished off the last Asadar. The Dark Paladins fought as hard as they could but in the end the Wolfen used their extra pair of claws to tear the Undeads bone from bone. 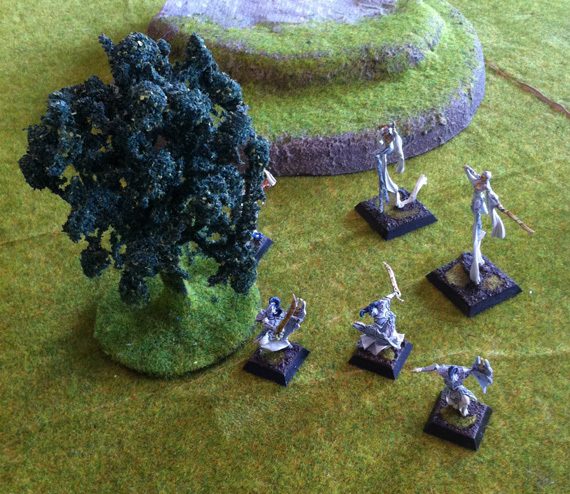 I lost first game on splitting my army to widely and assuming the Undeads were fragile as in other games. They are not! They are tough. I made a series of other stupid mistakes throughout. I lost the second game as well (which was won by Undeads), but felt I had tactics much more under control. Lots and lots of 1s lost the game for me combined with me not knowing my opponents miniatures, but I think second game was more balanced. It is quite important in a 3-player game to choose who goes first even if your army isn’t directly affected by it.